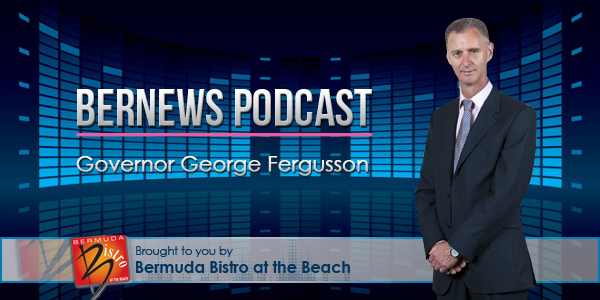 In this latest Bernews podcast, we interview George Fergusson who will soon be stepping down as Governor. He touches on a wide range of issues such as turning down a request to hold a Commission of Inquiry into the Tucker’s Point land matter, the airport redevelopment, the effect on Bermuda of Brexit, the British Government’s stance on slave trade reparations and more. And Mr Fergusson re-iterated his belief that the Commission of Inquiry into issues highlighted by the Auditor General’s reports was the right thing to do. On the airport, Mr Fergusson said a document outlining how the Bermuda authorities will address concerns about the new airport has been submitted to the UK Government. A Deloitte report assessed the public private partnership between CCC and the Bermuda Government and discovered areas that could be improved. In a Letter of Entrustment to Bermuda, the UK Government stated that the UK and Bermuda Governments had to “agree on the measures needed to address the “deficiencies” in the Deloitte report”. It added that the Bermuda Government had to “publish a written and evidence-based assurance that the required measures have been taken, before the contract can be concluded”. On the Commission of Inquiry for Tucker’s Point, asked if he thought it had damaged the position of Governor he said no, but he added: “I took it seriously. I did pay attention. “I did a lot of research and was surprised and how detailed the checks and balances were in that 1920s legislation. “The bit that did worry me more, there did seem to be something in the allegations of a series of questionable deals by possibly colluding estate agents, lawyers and bankers in the 1950s, ‘60s and ‘70s. We may not have agreed on everything, but I must say that this governor is the most personable one that we’ve had in a long time. Best wishes to him and his family in the future! He did an excellent job maintaining the status quo, in true British form. Assaults on human dignity were upheld by Government House, in true British form. To be expected from someone appointed by royalty. By assaults on human dignity I assume you are referring to the non status of PRC and gays in our country? Thank you for your devoted service to Bermuda and her people. Safe passage to you and yours.